My reading has been determined by the set texts provided for our new A Level course. You will know that I am not a natural reader of non-fiction, but if you have been keeping up with my rapid book consumption of recent weeks, you will also know that I found both Jeanette Winterson's autobiography and Alexander Masters' biography of Stuart Shorter fascinating and compulsive. Returning from the North of England, I put my efforts into completing Stasiland by Anna Funder. Like, Stuart, A Life Backwards, this is written in the genre of literary non-fiction. Whilst it endeavours to be a reliable, factual account of life behind the Berlin Wall and the effects on the people who lived in its shadow, it also has strands that run through the whole book, making it pleasingly cohesive. Anna Funder recounts stories of those affected by the Stasi and punctuates their retelling with pertinent political context and personal evaluation. Whilst I didn't find this an easy read; I occasionally got bogged down in the politics when I really wanted to find out more about the people she interviewed, I did find it compelling. 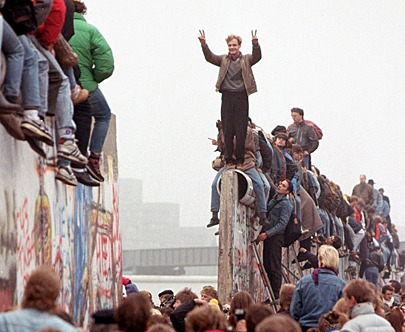 I was 19 when the Berlin wall came down. Before the news footage, I hadn't given the GDR any thought at all. Yes, there was an iron curtain, yes there was communism, but that was all over there and nothing to do with me. I was politically naive and unaware. But the wall coming down had more impact on me than you might expect. I had made a friend during my first year at university who was German and studying over here on a year's exchange. She had come home with me for the holidays, and I was watching TV with her when the news of the breaching of the wall was reported. She was understandably emotional. For her whole life, Germany had been segregated into the Eastern German Democratic Republic (GDR)and the Western Federal Republic of Germany, (FDR). She seemed to me to be excited and terrified at the same time. Her impressions of those who lived behind the wall was not wholly positive, that many were drunk and desperate; indeed Stasiland reinforces that alcohol consumption was higher than average in the Eastern sector. Her country was changing before her very eyes. Something that had seemed permanent had been torn down and some upheaval and readjustment would be necessary. How timely that I was reading this as we have voted to tear down our connections with the EU. My political views are moot at this point, and probably this is not the place to air them, but let's just say I watched the news reports on Friday 24th June with a sense of forboding that my country was changing before my very eyes and I had woken to a world out of kilter with my sense of rightness. It is so true that politics affects lives. 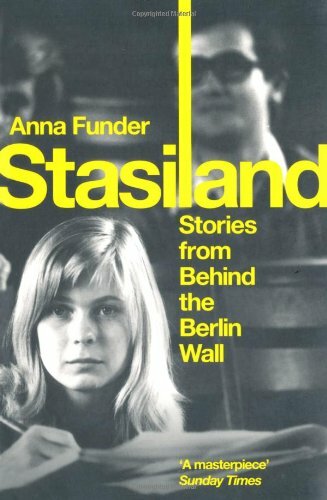 In Stasiland, Anna Funder tells of Miriam whose husband died in a Stasi police cell (not a spoiler, this comes at the end of chapter one and serves as a hook for the remainder of the book). It tells of Julia whose intelligence remained unrewarded as she was submitted to surveillance. It also tells of the men themselves, the members of the Stasi who watched, organised, arrested, imprisoned.Through the multiple voices, a picture is created of a place that was controlled, organised and restrictive. Anna Funder is the author who is putting puzzle pieces together to enable the modern reader to understand the complexities of a place and its people. Like the puzzle women in Nuremberg, Funder reconstructs lives led, lost and changed by experiences in the GDR. This book shocked me. The naive 19 year-old didn't have more than a passing interest in her new friend's reaction to the destruction of an edifice that had seemed impenetrable. 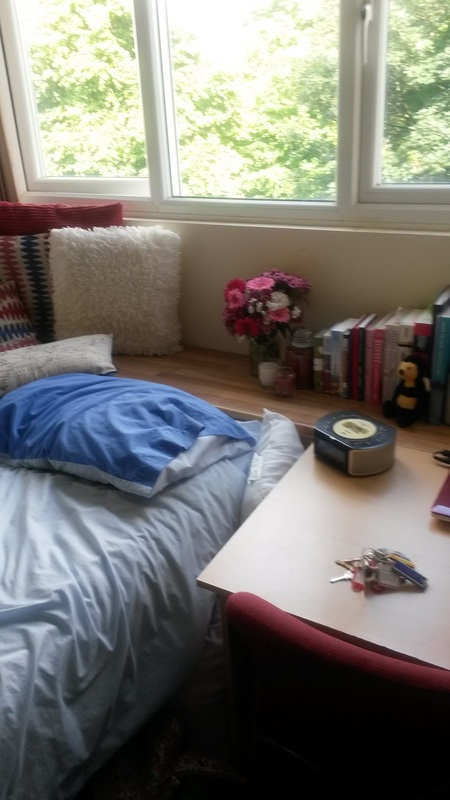 That version of me was too absorbed in the safe minutiae of my own burgeoning independence to even begin to contemplate the changes that caused her to feel homesick and uneasy. I dedicate my reading of this book to her. I could have and indeed should have, felt more curiosity. Stasiland is well-constructed and empathetically written. I learnt a lot. I was also painfully aware of how much of the world's politics remain easier for us to ignore than engage with. Maybe we just find it hard to cope in the global village where problems and injustices seem so much bigger than we are. Books, both fiction and non-fiction, can give us a window on these things and make us reconsider our views, our preconceptions, our judgements and our responses. If Stasiland made me engage in an area which before I had known little of, The Examined Life had the absolute opposite effect. This book, read as fast as I could because I wanted to stop as soon as possible, did absolutely nothing for me at all. A series of case studies, it could, in theory, be comparable to Funder's text, but for me, they were in totally different leagues. Funder educates her readers by drawing them into the life and politics of those who had lived through Nazi rule, communism and then Western capitalist democracy. Some of those stories were sad, some were horrifying, some were of courage and others were of submission. Stephen Grosz's case studies were of patients who had been treated in his psychoanalysis clinic. The blurb states that they are "simple stories of encounter", and therein lay the problem for me. Each chapter is so short and each client so reduced that I failed to connect with any of their problems or to be convinced by any of the resolutions or conclusions reached by the therapist. 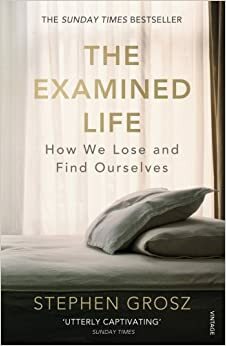 Whilst I write this I am aware that my inability to engage in the book and the psychoanalytical method may, in itself be interesting to a psychoanalyst! I do have very vivid dreams, so I could be interesting at a subconscious level I suppose....but I think I am too pragmatic for this approach. And when read next to Stasiland, the subject matter seems introspective, self-involved and possibly even a little indulgent. But I am aware of my limits; I accept that I would be someone highly resistant to this sort of probing, and rather than condemn the practice, I will leave the book and the therapy to your reading. I know several of my students have found the text fascinating...but I think my colleague might have to supervise any coursework that arises from this one!